Sure, this kind of zeal is probably irritating to people who aren’t intimately involved with the Taylors, but I live for this enthusiasm. It has contributed to the highest highs and lifted me up from the lowest lows in my life. It’s the kind of passion that has the power to permeate a deflated spirit that comes with the most terrible-horrible-no-good-very-bad-day. The passion shows through in my family’s cooking. Not in a corny way like I cry into a soup and everyone in the restaurant cries too, but I really love watching people eat food I prepare for them especially if it’s a group who makes me feel all warm and fuzzy inside. I spent the weekend cooking up a storm with my mom and we made an awesome menu comprised of this corn, fish tacos, papas fritas, and a banging kale salad. It was, if I do say so myself, the BEST MEAL EVER (or at least, of the summer thus far). This street corn is a riff off of my sister’s favorite corn from a restaurant in Nantucket. Unfortunately, she missed it this time, but #humblebrag, I think it’s better than the restaurant version. It’s going to become a staple in repertoire and I see myself making it every time I have access to a grill this summer. salt & pepper to taste Preheat the grill to medium-high heat. Fill a large bowl or pot with water. With the husks still attached, place ears of corn in water and soak for 30 minutes. While you soak the corn, make the crema. In a medium-sized bowl, mix together mayonnaise, lime juice, ketchup, vinegar from the japeleños en escabeche until combined. Add salt and pepper to taste. Remove corn from water. Place corn on the grill for approximately 10 minutes. Remove ears of corn and peel back the husks one layer at a time, keeping the husks intact. Remove the silk and discard. Brush each ear of corn liberally with the crema. Transfer corn to grill to cook, turning occasionally. Grill corn for approximately 20 minutes until charred and cooked through. 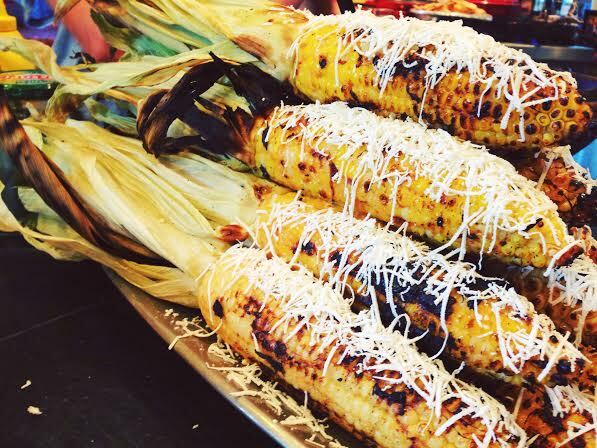 Sprinkle grated cheese directly on the warm corn and allow to melt. Best served alongside a massive margarita. I don’t even know how to light my grill, but I’m going to figure it out just so I can make this. Sounds like the BEST CORN EVER!! !